Given the Idiom shortage, I don't know what I'll do. I would like a president that wasn't interested in re-fighting vietnam or reliving woodstock. I would like a president that wasn't afraid. I would like a president that rebuilt a country that built stuff. I thought John McCain was the best republican candidate of 2000. In 2008 he often appeared unfocused and unsharp, too tired and old for the office. Now he's the presumptive nominee for the Republican side of the US, the second best of a bad lot, and perhaps if he naps through his presidency and refrains from singing Beach Boys parodies, he won't do the country or the world much harm. I always thought that Hillary Clinton was the brains of the Clinton operation. Perhaps if she gets laid once in a while (send in the male interns!) she'll mellow out and drop most of that control freak behavior. She should maybe go to France or something. Their president seems to have a good work/life balance. "Democracy is the theory that the people know what they want, and deserve to get it, good and hard". I have to say that it has been the most interesting political season in my memory, and despite my disappointments so far in 2008, call me crazy, I have hope that someone worthwhile will get elected... in 2012. For the last year I have been bumming around the world and observing how the internet functioned, and how it was being used. I gave a long talk on the subject recently and while I wait for it to get edited down, I thought I'd post some observations one blog at a time. 1) The future is here, but it isn't evenly distributed yet. Further, it is unlikely to EVER get evenly distributed due to the concentration of IPv4 space in the US and the apparent cost savings of centralizing major services like search, etc, there, rather than closer to the user. 2) Devices are getting ever more capable, with ever more storage, and you don't have to use it all up for movies and mp3s. You CAN take your pages with you. I increased my firefox settings to cache 2GB of stuff (up from the paltry 50MB default), and to not expire items for 90 days (up from 9) Result: surfing a number of the sites I do regularly has had a noticeable speedup in throughput, and finding things that I searched for once, and not again, in my local cache, has been a delight. Given that I have a 120GB hard disk, using up 2GB to save me time was a no brainer. 3) Caching the internet is broken. So many sites assume very dynamic content when in reality, the content is fixed and stable for years after the initial post. Take blogs for example. Most blogs do not specify an expiry time, and thus, aren't cached. Even permalinks don't specify an expiry time, and thus, aren't cached. I'd argue that the front page of a most blogs should expire in 5-20 minutes - or so - minimum, more if you only post once a day - and that the permalinks should gradually increase their expiry time - say every 5 minutes for the first day they are up, to 20 minutes the second, and gradually out to a couple weeks or more after that, dropping the expiries time down back to 5 minutes after a new comment is posted. Too much of the web and blogosphere are being built on an "easy bandwidth credit" basis. A cache economy, like a cash economy, has lower transaction costs for everyone involved, at very little cost in immediacy of content. Take a look at the expires data for your blog (it's easy in firefox - click on tools->page info) and especially - the images you use (bring up the image - look at the expires information) - and even more especially the css, which rarely changes - and figure out if you could do more to save on internet traffic. The bandwidth you save may be your own. I have tried, and tried, and tried, to adopt one of the whizzy new editors out there, like eclipse. I get by on vi for small jobs, but always, when the job gets big, I fall back on emacs with etags, ecb and a few other tools. I can generally crash eclipse just by looking at it in situations when emacs chugs along nicely. 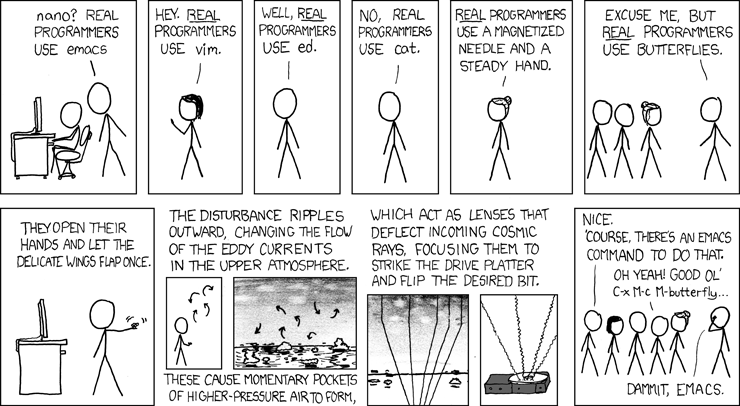 I've been staring at emacs for a few too many hours lately. It really bothers me that emacs is the only tool left, it seems, that doesn't use anti-aliased fonts. There's been code in cvs for it for forever that moves it up to 2008 standards, but they aren't compiled in by default on most Linux distributions, so for years now I've had to compile my own emacs. I meant to do it for this machine on day one but never got around to it til this morning. Now, there's a package that does it for ubuntu that you can just install. My joy lasted about 30 seconds. I'd been running emacs out of a terminal window in sheer frustration, even then my eyes getting blurry after only 10 hrs of coding, and I loathe the emacs menu bars, the icons, and especially, the scrollbars. I don't want scrollbars - I have cursor keys, page up/page down keys, a mouse with a scrollwheel, why the hell do I need scrollbars? Then there's this sorta half character gutter thing that offsets each window - I don't want that... and I can't remember how to turn it off right now. There's just something about green that brings out the programmer in me. Can't remember how to do green... All that time spent in front of easy to read green terminals in my youth, the code printouts on green paper... And butterflies! I need butterflies to fetch me my .emacs file!